Parents and community members play an important role in their children’s education and a strong partnership between parents and schools enriches the learning experience. Regular newsletters are sent out on a Thursday on a fortnightly basis to parents. All the communication is sent home in the pupils’ personal communication file. We have the communication tool called the School Communicator which will carry up-to-the-minute Craighall Primary news, events on a daily basis. This application, once installed on your computer, will automatically update and pop up on your screen with all the latest developments at school. You can keep it minimized and call it up when you want to check for updates. Click ‘Download’ at the top of the screen and select Craighall Primary from the drop down menu. Follow the instructions from there. Parents are encouraged to meet with any staff member at a mutually convenient time to discuss relevant issues and concerns. Your child’s homework book may be used to communicate with the teacher. Should you require a meeting with a teacher, please contact the front office to make an appointment, or you may request a meeting via the homework book. The school has an established procedure for dealing with grievances, and we urge you to use this system to resolve any issues relating to your child or a staff member. 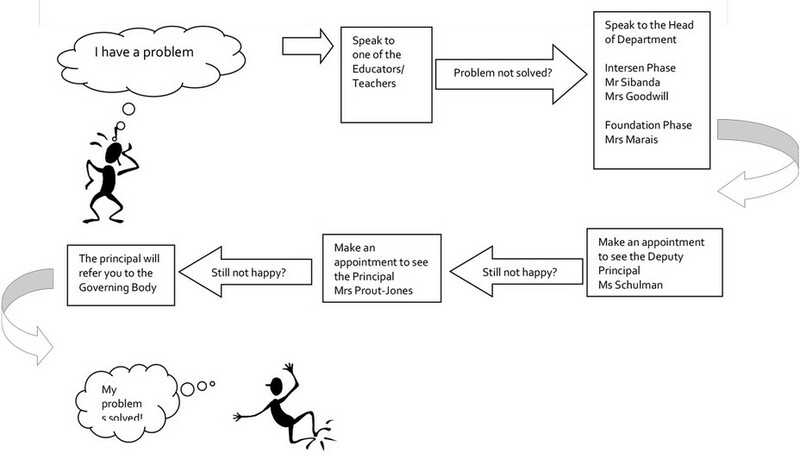 The diagram will show you how to go about addressing a problem. If a sensitive issue is to be raised with a particular teacher, please send a letter in a sealed envelope marked for his/her attention – Do not write in your child’s exercise books or homework diary.